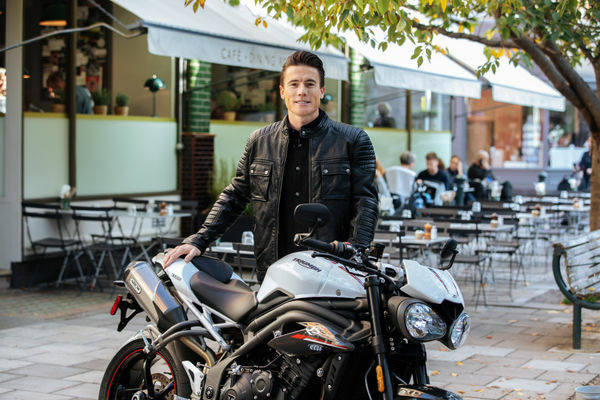 Triumph Motorcycles are delighted to announce a new and exciting partnership with James Toseland as Triumph Moto2TM racing ambassador. James is delighted to represent Triumph Motorcycles and help to raise the profile of our brand around the world. James Toseland became the man to beat in high level motorcycle racing from the early 2000s having completed 5 consecutive years of the World Superbike Championship, finishing in the top 4 positions between 2003 and 2007. James’s determination really paid off, becoming a 2 time World Superbike Championship winner in 2004 and 2007, riding for different manufacturers. He also completed two years of racing in MotoGPTM, the premier class of the sport, during 2008 and 2009. An injury forced James’s early racing retirement in 2011, however Triumph Motorcycles recently coaxed James back into riding a race bike for the first time in 7 years. James took to the Silverstone track in August 2018, the spiritual home of British Motorsport, aboard the Triumph Moto2TM engine prototype bike during poor weather conditions, but this was enough to hook him back into riding again, if only for fun! James is a multi-faceted individual; as an experienced presenter, he is currently retained by BT Sport as a commentator in the MotoGPTM, Moto2TM and Moto3TM series. James has also utilised his experience to mentor and develop many young riders coming into the sport. James’s other clear passion is music and alongside his multi-award winning wife Katie Melua, James himself is an accomplished musician and his band “Toseland” tour extensively. APRILIA RSV4 RR EXPOSED | GETS BETTER FOR 2019!